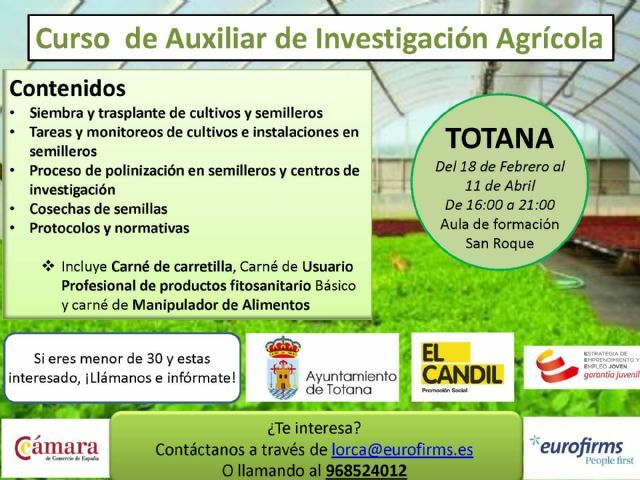 The City Council of Totana and the Collective for Social Promotion "El Candil" will organize an Agricultural Research Assistant Course within the framework of the Youth Entrepreneurship Strategy and Youth Employment-Youth Guarantee program, from February 18 to April 11 . This training initiative is aimed at young people under 30 years of age and will be held from 4:00 a.m. to 9:00 p.m. in the training rooms of the Social Center of the San Roque neighborhood, and with the collaboration of the Chamber of Commerce. The participants will deal with diverse contents such as the sowing and transplanting of crops and seedbeds, the tasks and monitoring of crops and seedling facilities, the pollination process in seedbeds and research centers, seed harvests, protocols and regulations. In addition, this action includes the carts, the professional user of basic phytosanitary products and food handlers. Interested persons should request information or formalize their registration through the email lorca@eurofirms.es or phone 968/524012.